Home Law Acts of War Thrawn’s Web: Were Rebel Forces in Zero Hour a Lawful Target? Thrawn’s Web: Were Rebel Forces in Zero Hour a Lawful Target? Cue up those ominous pipe organs from Grand Admiral Thrawn’s theme song, because the Empire’s master tactician finally cornered the Rebellion in Zero Hour, the season finale of Star Wars Rebels. 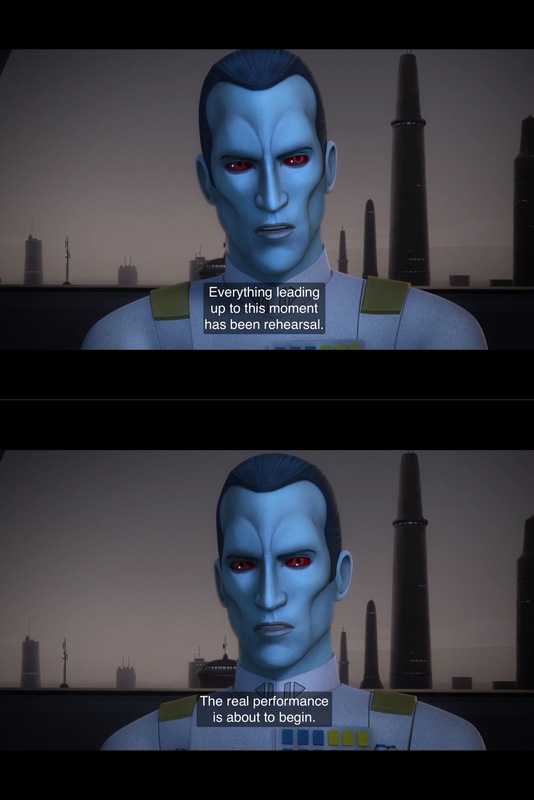 After discovering the Rebel Alliance’s secret base on the planet Atollon, Thrawn swept in with his fleet to crush the Alliance and, in true bad guy style, delivered some dastardly lines to the heroes about their impending doom. How many times did you practice saying that one in front of the mirror, Grand Admiral? In Zero Hour, Imperial forces took decisive offensive action against the Rebel fleet and its secret base (as well as a very pissed off Bendu). The episode was truly unique because we have never seen the Imperials launch a large-scale attack against a combined element of the Rebel Alliance in the show. In the real world, offensive military operations are shaped through careful and deliberate planning. A critical part of that planning process involves making sure that the use of force will be lawful. Since the audience was mercifully spared from any scenes involving the inner workings of the lengthy and arduous military planning process, let’s fill in the gap by analyzing whether Thrawn’s assault was legal. The nature of the attack really sets the Imperial assault on Atollon apart from other skirmishes in Rebels. Time and again Rebels has shown the Imperials in a reactive stance in which the Rebels attack and the Imperials respond. In those situations, Imperial forces typically rely upon their inherent right to self-defense to justify their use of force. Unlike those scenarios, Thrawn’s assault in Zero Hour is an offensive operation in which the Imperials seize a tactical advantage to surprise and destroy the Alliance. Here, instead of defending themselves from attack, the Imperials are the ones pressing the fight. 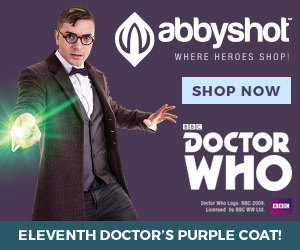 Thrawn, the skilled maestro…except instead of violins and trumpets he conducts scathing batteries of turbolasers and legions of deadly ground forces. One of the central legal issues is whether the Empire could lawfully attack the Rebels, who were not actively engaged in any type of combat at the time. Militaries cannot legally use force against anyone they wish. Under the law of war, force can only be used against those who are considered hostiles or are part of a hostile force. A person or group can be considered “hostile” in one of two ways: By being declared a hostile force or by demonstrating hostility through one’s conduct. Certain high-level officials have the legal authority to designate (or declare) that a group is a hostile force. Once the proper authority makes that designation, that group is officially called a “declared hostile force.” That status has a serious effect. Declared hostile forces can be lawfully attacked even if they are not openly engaged in hostilities. For example, in World War II, the German Army was declared a hostile force as part of the United States’ declaration of war. That status means that if Americans spotted a group of German soldiers singing kumbaya around a campfire they could attack them, even though the Germans weren’t engaged in combat. Alternatively, if an person or group is not part of a declared hostile force, they can become a lawful target through certain conduct. If a person or group displays hostile intent or commits a hostile act, they can be lawfully attacked based on that hostile conduct. In other words, if someone’s conduct reveals that they are hostile, they can be lawfully attacked. The Jedha ambush scene in Rogue One is a great example of conduct-based targeting. Before the attack, Saw Gerrera’s fighters were indistinguishable from other civilians milling about in Jedha City. Therefore, Imperial forces had no legal basis to attack them. However, once they started firing on the stormtroopers, they were committing hostile acts—conduct that revealed their status as fighters and legally justified the Imperials’ use of force against them. In Star Wars Rebels, those in Imperial high command would have almost certainly designated the Rebel Alliance as a declared hostile force by the time of Thrawn’s attack. The Alliance would have given them good cause to do so, having staged numerous significant attacks against the Empire across the galaxy. These attacks meant that the Rebellion was engaged in open hostilities with the stated purpose of overthrowing the Imperial government, which would have justified the designation. The Empire would have wanted to grant field commanders like Thrawn the tactical flexibility to respond to the growing threat and crush Rebel forces. Labeling the Rebels collectively as a declared hostile force would have done just that, opening the doors for Imperial forces to hunt and destroy without first waiting to observe a hostile act or hostile intent. In Zero Hour, that meant that the Rebel base on Atollon and fleet above it were valid and legal military targets, even though they weren’t actively engaged in any sort of fighting. Having discovered the location of the base, Thrawn was free to bring his tattooed Star Destroyer and the rest of Seventh Fleet to bear on the unsuspecting Rebels. If sound could carry in space, Thrawn would have ordered the fleet to blast ‘Thunderstruck’ by AC/DC (an orchestral version, of course) as it arrived in orbit above Atollon. Even if the Empire had not declared the Rebel Alliance to be a hostile force, Thrawn could have still been legally justified to attack based on the Rebels’ actions. To do so, the Rebels would have to display certain conduct in the form of hostile intent or a hostile act. Under the law of war, hostile intent is defined as the threat of imminent use of force against friendly forces. At the start of Zero Hour, Thrawn reveals that a Rebel attack is indeed imminent. Thrawn first discloses Imperial intelligence reports that a large Rebel attack is coming. Additionally, General Dodonna’s Massassi Group, one of the largest Rebel military cells, was known to be on the move for a rendezvous, which strongly suggested that a coordinated attack was coming. Thrawn surmised that the TIE Defender factory on Lothal was the target, given its location and significance. Agent Kallus then delivered the final piece of the puzzle, as his intercepted transmission synced with Dodonna’s trajectory to reveal the hidden Rebel base. That last bit of intelligence effectively corroborated the other pieces, thereby establishing that the Rebels were moving to launch their first coordinated multi-cell attack. Under the circumstances, the Rebel attack on Lothal would have almost certainly been deemed to be an imminent use of force. Phoenix Cell was heavily armed and had a history of combat operations against the Empire. Meanwhile, General Dodonna was a known Rebel military commander flying through hyperspace with a bunch of combat-ready vessels, not some gaggle of cargo freighters. The Rebels ordinarily avoided massing their forces, so the rendezvous of Phoenix Squadron and Massassi Group strongly suggested that an attack was in the works. Similarly, the impending rendezvous also underscored the imminent nature of the attack. Dodonna’s forces were on the move at the start of the episode, which meant that the Rebels were in the process of marshaling their forces. 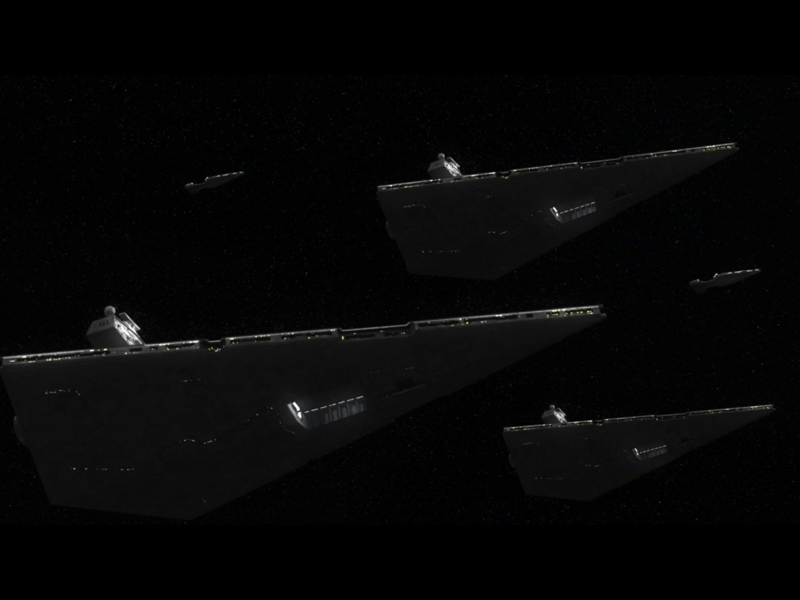 Given the Rebellion’s aversion to massing their fleet for extended periods, it was highly likely they would spring their attack soon after linking up. Under the law of war, Thrawn had no obligation to wait and engage the Rebels above Lothal. Once Imperials determined that the Rebels were displaying hostile intent, they were free to move in and use force. Grand Admiral Thrawn did what all tactically proficient commanders should by seizing upon the element of surprise and attacking at a place and time the enemy was not ready. 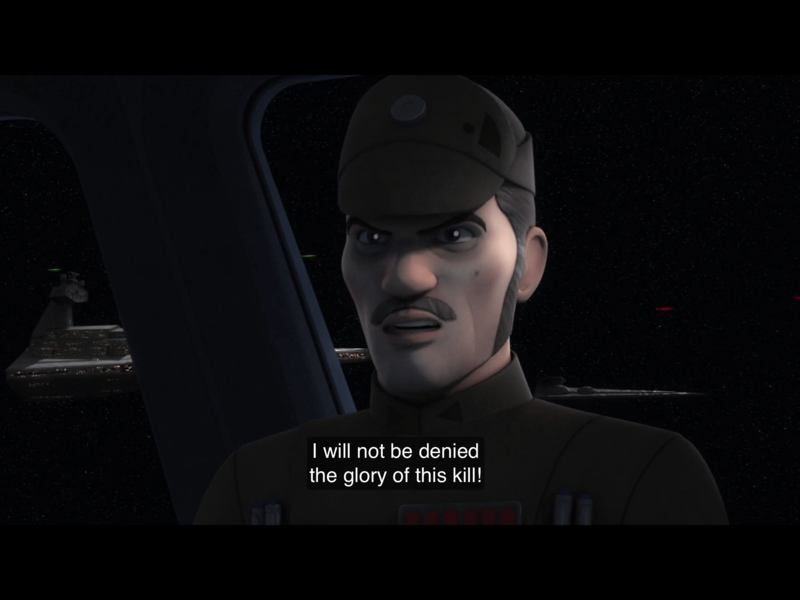 Therefore, the Rebels’ conduct represented hostile intent that justified Thrawn’s attack. Thrawn’s devastating attack on the Rebels showcased the escalating stakes of war for the Alliance. Although the law of war sets certain boundaries for lawful conduct within a war, it does not guarantee that you get to fight on favorable terms. The Rebellion’s own successes painted an ever-growing target on their backs, fueling the Empire’s desire to burn them out. Fortunately for the Alliance, buffoons like Admiral Konstantine and Admiral Ozzel exist, helping them escape and fight another day. For his efforts above Atollon, the Empire posthumously honored Admiral Konstantine by granting him the glory of naming a trash compactor inside the Death Star after him. Previous articleWhat are Iron Fist’s Duties as a Landlord? Next articleWhat Happens when the President is Actually An Alien? I highly doubt the Empire follows anything we’d recognize as the “laws of war”, or at least only does when this suits them.